Yesterday we officially entered Holy Week with Psalm Sunday. This week leads to the highlight of the Church's year. Today, March 25th should be the Feast of the Annunciation but it has been put off this year for a fortnight, til April 8th. This is because nothing trumps Holy Week or Easter Week. In reality, the next two weeks are just one long celebration of what for the Church is really one event; the passion, death and resurrection of the Lord. In today's Gospel of John (12:1-11) we begin to see the split and infighting that is going on. 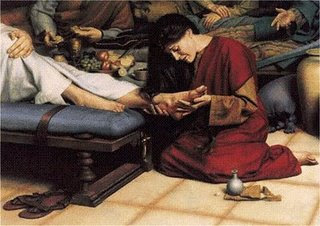 Judas, when he saw Mary put the expensive ointment on Jesus' feet protests that the money should have gone to the poor. The worldly way of seeing things has entered the apostolic group. The pharisees and Jews had come to see Jesus and Lazarus who had just been raised from the dead. Instead of acknowledging a great miracle, the Jews decide that they must kill Jesus and Lazarus. Their hatred is now spreading to those whom Jesus has helped and those who follow him. And Jesus is not stupid, he sees what is coming. But he walks willingly towards the cross, always obedient to the will of the Father. He could have faded away into the hills but he chooses to go on.